I have boards that are ~ 2" thick, ~15" wide, and x feet long. I would like to divide these boards in half. I do not have the funds to buy a large bandsaw or other power tools. I'm looking to trim the thickness and wind up with two boards around half the thickness. What is the best way to divide these boards evenly (and close to level)? What tools to I need to buy? As you requested I'll concentrate on a handtools-only approach but fair warning, even on smaller boards this can be a lot of work and difficult to do accurately. On boards 15" wide it will also pose a great challenge physically — hard work, and for some hours. The splitting of an existing board you're looking to do here is referred to as re-sawing, because you're sawing again what was previously sawed in a mill. The traditional way this would be done, the method that would be recommended in older woodworking books, would be fairly simple in outline: you begin simply by marking or gauging your cut line across the middle of both long edges and the board ends, then, holding the work in a vice, begin sawing using the right saw (a rip saw, which is made specifically for sawing along the grain). Note: the vice must be attached to something fairly stout and heavy, ideally immovable, in order that energy is not wasted in moving the table as you saw. This is one of the reasons for the great heft of traditional woodworking benches. The above description of the method makes this sound fairly easy and straightforward but in practice it's anything but, especially on boards of significant width and/or length. There's a significant improvement to the above possible but unfortunately it requires quite a bit more work or your behalf as you need to build the #1 item on the tool list, the kerfing plane. Read more about that here on the Unplugged Woodshop site, with video to go along with it. The job of the kerfing plane here is create a starting groove along all four edges of your boards. Saws naturally want to track in existing grooves (taking the path of least resistance) so this makes it much easier to saw straight and true through the length of a board. It's not a 100% fix, but it's a big help so if you're re-sawing a lot by hand one of these is worth making. This is a disadvantage as they neither rip nor cross-cut as well as dedicated saws for these jobs, however they have advantages too. Their teeth are "impulse hardened" or induction hardened making them much harder than those on traditional saws, so blunt far less quickly even in hard and tough woods, but most especially when cutting manmade boards such as plywood and MDF. And the modern tooth geometry means they do some cutting on the pull stroke (as well as the main cutting done on the push stroke). They're also significantly cheaper, perhaps 1/5 the price. 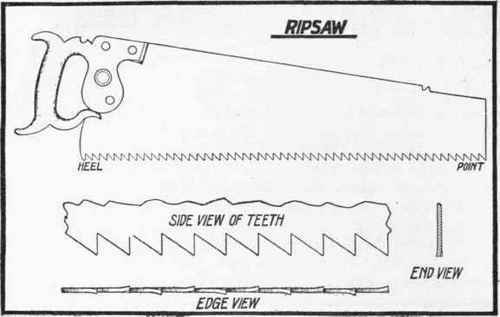 A lot of Western woodworkers today use Asian-style saws (in practice nearly all Japanese) for some or all of their cutting. 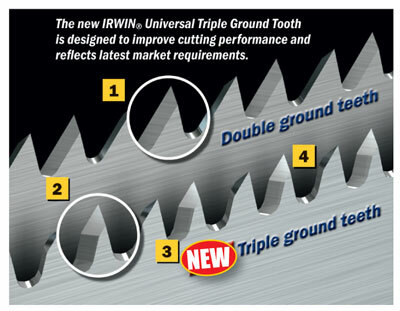 These saws can be very effective, tracking well and cutting very cleanly and swiftly because of the tooth geometry. But I don't think you should consider one because of the maximum length of cut. Many of these saws feature blades of 250-300mm, one foot or less, and as soon as you saw at an angle the length of the cut becomes significantly longer than your starting length of 15". So in order to do your cuts you'd need to saw the entire length of the board twice (working in from each long edge), in essence nearly doubling the work! Cutting a board along its thickness--in this case, cutting a 2" thick board in half to produce two ~1" thick boards--is called resawing. With practice, you can resaw the boards in half with a handsaw or frame saw or traditional bow saw (not to be confused with a modern bowsaw, which is better suited for pruning trees and cutting small logs). If using a frame saw or traditional bow saw, the wider the blade from teeth to back, the easier it will be to make a straight cut. One method is to first rip the boards to narrower widths to bring them down to the capaciy of your preferred resaw tool. (Ideally you'll want to rip the boards using a tool and blade that produce a clean, thin kerf so you can easily match up the grain to hide the cut later.) Inexpensive bandsaws and 10" table saws commonly have a resaw capacity of about 6 inches or less (the table saw will require several passes across opposite edges), so in your case you could rip the 15" wide board into three roughly 5" wide boards. After that, you can resaw those individually on a table saw and/or bandsaw, and glue the ~1"x6" pieces back together. Another method is to cut a kerf along each edge with the table saw, then use a handsaw to cut out whatever was left behind by the table saw, and plane the boards flat after resawing. This is easier than just using a handsaw since you can use the table saw kerf as a guide for your handsaw, but unfortunately it also results in more waste and thinner boards. Regarding answers recommending you find a sawmill... If these boards are salvaged and could have nails in them, no one is going to do the job. They won't risk their machinery. Otherwise this is your best bet for getting these boards resawn. You're clearly a novice, so realistically speaking there is no chance at all - none - that you can resaw these boards yourself. They are too large, and you have no experience. It's nothing against you; I couldn't do it either, and I have some experience and know-how. Your best bet is to sell the boards, which are likely worth quite a lot if they are in good shape, and buy the lumber that you actually want. Not the answer you're looking for? Browse other questions tagged technique tools or ask your own question. How do I know when it is too cold to work outside?